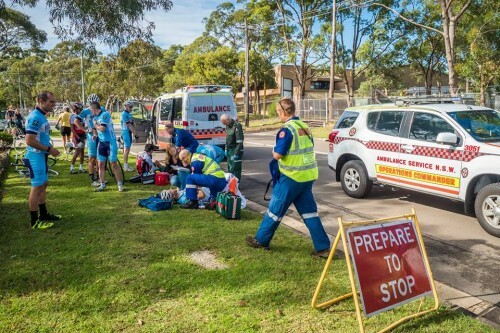 While this photo may be confronting, this is the reality that riders can face when they crash. A lot of these incidents are avoidable with riders showing some commonsense and race smarts. This article gives a few pointers that riders should keep in their minds when racing, so that they race and get home safely. We can reduce these incidents by racing smarter. With so many new riders entering the sport, it is important to ensure that everyone is keeping their skills up to date and not simply relying on watching the Pro’s and then trying to copy what they are doing, without realising the level of experience and skills that these riders have, far exceed our own. Nothing is more disappointing for a rider or spectator when we hear and see the crash and crack of carbon and bodies on the road during a race. Riders may break bones, destroy their bikes and even light falls can mean ruined kit, sleepless nights and painful showers while dealing with the road rash. Too many riders are turning up to races thinking that because they have seen it on TV or watched it on Youtube that they now know it all and this is endangering themselves and others riders. Often high speed crashes in races aren’t just injuring the foolish but bringing down multiple riders at the same time. This isn’t cool. While this list isn’t exhaustive, it is more important than your sock height or the gears you are running on your bike. This list is mainly focused on the lower grades of racing, but that is not to say that many of these rules don’t apply. Crashes are expensive and painful, don’t become a victim. 1. Nothing of importance is happening behind you in a race. Riders seemed to be obsessed with constantly looking over their shoulder to see what is happening behind them. Now I understand that your 20 metre surge from the front of the pack may have given you the impression that you have just surged 300 metres clear of the peloton and riders have splintered all over the road. The reality is often more mundane, there is either a rider right on your wheel or the peloton is still just rolling around not reacting to your turn of power. Even more dangerous are riders who start looking over their shoulder once the race comes into the fast deciding sprint. 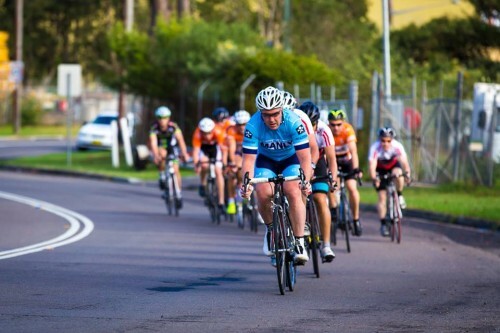 If you are on the front, focus on what is going in front, acknowledge that you may be starting the sprint from the start but don’t look over your shoulder and then unintentionally swerve off your line – the result – CRASH! If you hear a crash, don’t look over your shoulder and potentially create another incident. Winning the race, is decided by what happens up front – so that is where you should be looking during the race. Once you come into the final 200 metres riders should maintain the line that they are riding and sprinting. Don’t try and change direction to slow another rider. You have chosen your line, now stick to it. This increases the safety of the race, as riders who are now riding at their limit are more predictable and this should stop riders coming in contact with each other. No one worries about who came 22nd. What this means is riders shouldn’t be sprinting for victory or places from outside of the top ten riders. It is simply too dangerous as other riders will be slowing and spreading out from across the road. You won’t win the sprint from 15 riders back in a sprint. Simply accept that today wasn’t your day and start to ease up as you come into the sprint. Award yourself a 4th place. Just like you wouldn’t suddenly change direction or veer out from a wheel in a group ride, you don’t do it in a race either. Just because you are wanting to get around the rider in front, suddenly swerving out from behind that rider is most likely to result in one thing – crash! By swerving out, you may have chopped the front wheel of the rider on your left or right and as a result riders have come in contact and hit the road. You have to wait for a gap. 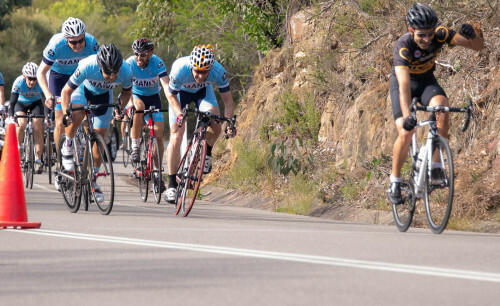 Many riders panic in lower grades when they see a lot of riders racing up the road and their rider in front isn’t reacting, it you are surrounded by other riders, this is referred to as being ‘boxed in’. What do you do if you are ‘boxed in’ – don’t just veer out, often you have to acknowledge that you have been caught out of position, you have to maintain your line and either ease off to try and create a gap by slowing or you simply have to wait until there is a gap to ride into. You can not push your way out, of make another rider change their line. The easiest way to remember is whoever has their handle bars in front, has the right of way. Like the drivers in a car who think they are genius for darting up the inside lane when the lane ends and everyone else has merged, you aren’t a genius rather you are an idiot. By diving down the inside you could be cutting the line of the peloton and causing potential incidents, there aren’t many courses that are decided by a single corner, so get around it safely and then work on winning the race. Many A Grade riders may use a different tactic but remember the level of skill and experience may be very different and don’t think they may also catch some verbal tips on course. Just like when riding in a group, be careful that your front wheel is not overlapping the riders rear wheel who is riding in front of you. A sudden movement by them, may touch your front wheel and bring you down. YOU are responsible for your front wheel. Yes we have all seen the pro’s descending a mountain pass on their top tube as Paul and Phil marvel at the speed they are going. Small tip, you aren’t a pro and 99.9% of races won’t have you descending a French Alp. There is no reason that a rider in a bunch during a race should be descending by getting on and resting on their top tube. 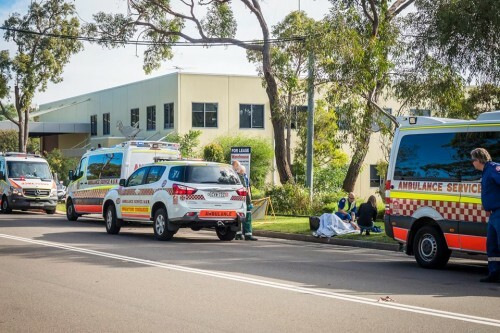 This is a very unstable position and many incidents have been caused as the rider gets out of that position and they wobble into another rider, resulting in a high speed crash. This position is completely unnecessary when descending in a bunch, even if you are the front rider. Don’t do it. This is a popular one with riders who are riding with a few mates and are thinking of themselves as a super domestique. They do their turn on the front and once they are finished or they want to get off the front, rather than just slowing to let a rider come round or smoothly rolling off, they suddenly swing off to the other side of the road at a very sharp angle. This potentially can wipe riders who have been moving up on the left or the right, when this rider just swerves off the front. So if you have done your turn at the front, either slow down to make another rider come around you or simply move slightly to the left or the right, don’t shoot off at a 90 degree angle to the other side of the road. Perhaps this should have been higher up the list. Individual riders have to take their responsibility and consider other riders when assessing their actions during the race. Never raced before? Then if it is your first crit, as it comes towards the end, just move towards the back and learn what happens, don’t try and mix it up if you don’t know the finish. If you aren’t a sprinter or you know that you don’t have the legs on the day for the sprint, then for everyones safety consider another race tactic on the day. Maybe go for the breakaway, attack some distance from the finish line, try a few different options but don’t mix yourself up in the finish if you aren’t going to be able to compete at the end. You are endangering yourself and other riders. 10. Everyone wants to finish in one piece. Maintain perspective. 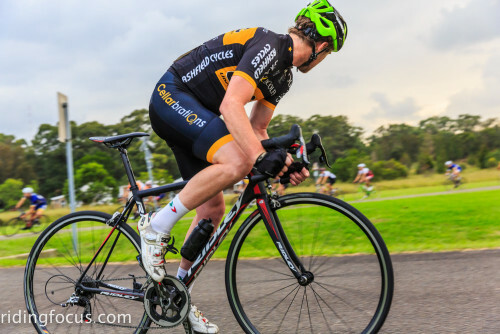 A broken collarbone, 3 broken ribs and a bike in two pieces may not be worth the $20 on offer for third place, so think safety and consider your fellow riders. We all want to race hard, we all want to win but we also want to be able to ride home in one piece. Accidents will always happen, that’s racing but we can minimise the unnecessary accidents and we can ensure safe and fast racing but following all of those simple steps above. All riders can continue to learn and are responsible for their and others safety. Finally, if you are on an open public road and out for a general ride with your mates, don’t think it is a race, wait till you have pinned on a number to race.